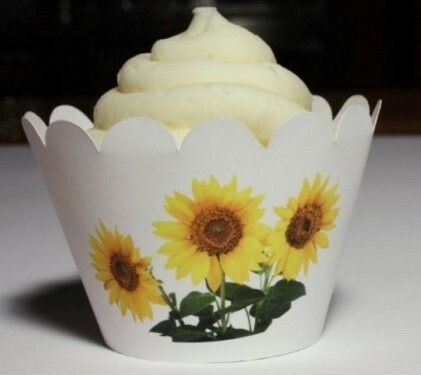 A Diva Entertains exclusive - our sunflower cupcake wrappers will create a stunning place setting or dessert table display. Frosting suggestions including sprinkling white frosting with yellow sprinkles or decorative sugar or tinting the frosting yellow. These cupcake wrappers are not for baking. They are used for display only. 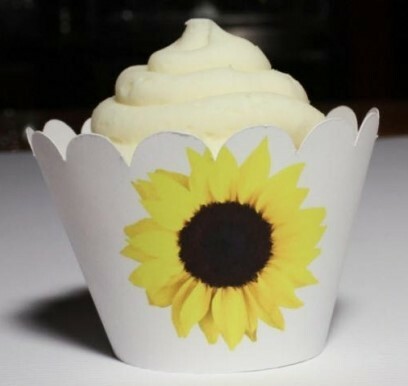 Our sunflower cupcake wrappers have a tabbed end that fits into a slit on the other end; very easy to put together although we also include a 'how to sheet' (you can also tape them together). Wrappers measure 2 1/4" to the top of the scallop.